WaggTagg™ is the new way to help find your dog if he goes missing. 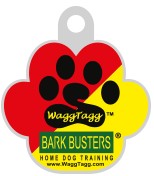 This is a FREE service for Bark Busters clients but can also be purchased in the USA and Canada. When someone finds your dog, they will either scan the unique QR code on the WaggTagg or enter the WaggTagg ID on our website. The person that found your dog, is then able to contact you. If your dog goes missing, log onto the WaggTagg website and change the dog's status to MISSING. 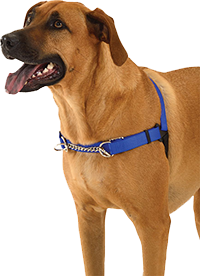 This enables the display of your information to anyone who finds your dog. 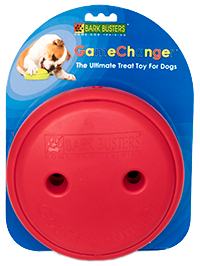 The GameChanger™ is the revolutionary new dog toy that will keep your dog busy for hours. Simply open up (easy for humans - hard for dogs) the GameChanger™ and fill with his favorite treats. He will be happily occupied working out how to make the GameChanger™ spill out its treats. This is ideal for a dog that needs to be kept occupied whilst alone. Provides a safe and fun way to satisfy a dog's natural desire to chew by reacting to your dog’s bite - reflexing back when your dog bites down on it. Potentially avoids boredom for a period of time. Boredom is often the cause of behavioral issues for dogs such as destructive behavior or anxiety. Is safer for your dog's teeth than hard toys that can potentially chip or wear teeth down. Made of Flexa-Pure - a soft but sturdy, washable, durable non-toxic PBA-free polyurethane material. It is a quiet toy if bounced around because it is made of the soft material – great if you live in an apartment or have hard wood floors. Two halves that lock together means you can mix and match colors. Current size works well for dog 10 lbs. and up. Want to run your own dog training business? We're looking for special individuals to become a Bark Busters franchisee. You will receive all the training necessary to become a professional dog trainer and run a successful business in your locality. We have vacancies in many states of the USA.